A foggy morning engulfed Burghfield as 34 RS Aero sailors descended on the club to compete for this year’s RS Aero UK Spring Champs. Our PRO for the day was Ian Bullock who did a fantastic job of keeping all the sailors hopes up in the briefing for the fog to clear and a breeze to fill across the lake. After a pleasantly lazy morning and early lunch the mist steadily disappeared and the breeze started to fill in, bringing on a hype of activity - BREEZE ON! Ian set separate Inner and Outer loop courses and we were off with marginal hiking! The 9 rigs were up first and the line was all clear - just! It came down to tactics and intuitive risk management as gusts and shifts frequented the 4 races. Dave Lynall (Bowmoor SC) took pole position to lead all 4 races with great speed and to win the 9 class over all. In the 7 rigs, Jonathan Bailey (Hunts SC) flew around the course with three 1sts to take the overall win from Ralph Nevile (Frensham Pond SC). The RS Aero Rooster UK Youth team certainly were reaping the rewards of their winter training with 1,2,4 & 5th in the RS Aero 7 class and a 5th in the 9s! Off the water there was a good vibe between all sailors with an interesting and challenging afternoon’s sailing. The prize giving had a wonderful spread to include prizes for the RS Aero UK Winter Championships and ten stage UK Winter Series, in addition to the RS Aero UK Spring Championships. The prize draw for the ‘50% off’ voucher for a new sail, kindly donated by RS Sailing, was won by Noah Rees of Torpoint Mosquito in Cornwall. 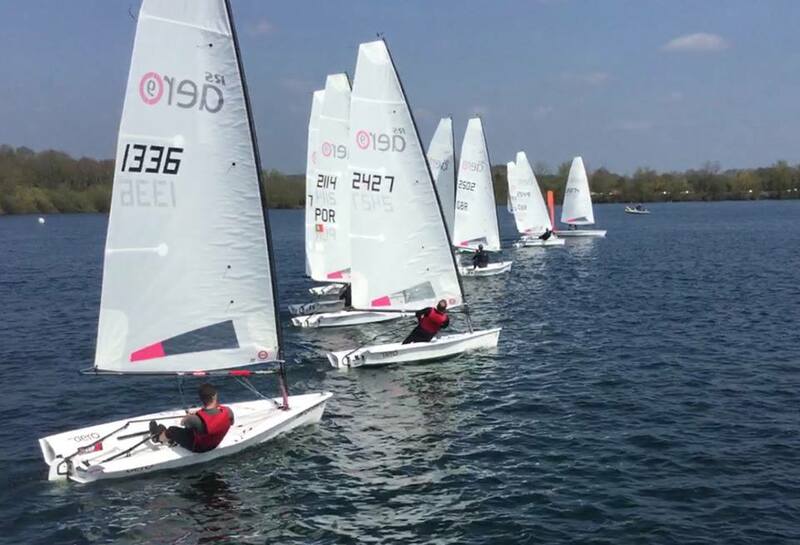 An enjoyable afternoon sailing in the warm sunshine was had by all and a big thank you to Ian Bullock, his team and Burghfield Sailing Club. Many thanks to SpeedSix for their support with a generous selection of prizes for the Spring Champs. The RS Aero UK Spring Champs was supported by SpeedSix. This event was round 1 of the UK Southern Circuit supported by Rooster and Noble Marine and round 2 of the Thames Valley Regional Mini Series. *Ultimately it is not about supporting a rig size but supporting 'The Sailors', and the RS Aero 5 fleet will always have its day when the wind blows or when we are at a more exposed location (we have 23 entered for the Worlds already!). Sure, light wind training in the right rig when preparing for a champs is important too, but there are plenty of other opportunities for that and this initiative allowed the good opportunity of learning a new rig and racing a larger fleet.